The Dow Jones Industrial Average (Dow Jones) futures prices have reached the expected target price line. Insurance stocks that have been rising for a long time are showing unstable flows. 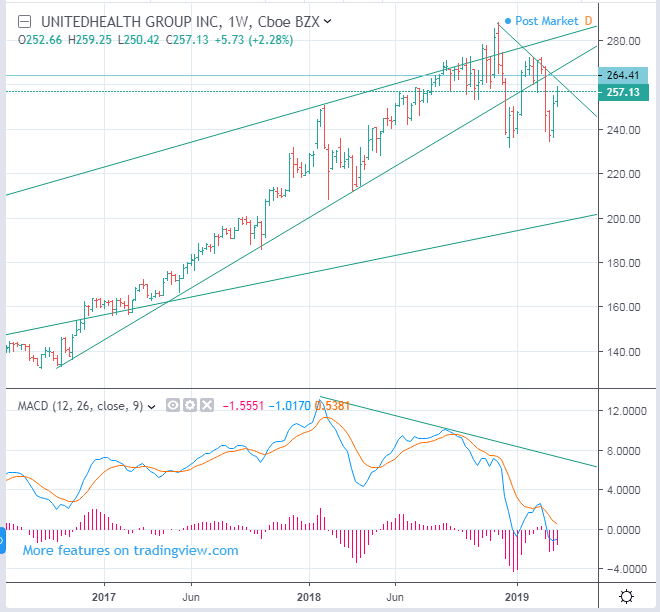 Below is a weekly chart of United Health shares. The important price line is 264.5. The graph looks very unstable. I do not know whether insurance stocks will start to decline. At this point, what I can tell is that insurance stocks look risky. Progressive (NYSE: PGR), Allstate (NYSE: ALL), Travelers (NYSE: TRV) and Visa (NYSE: V)... all are the same. I sold some Allsate stocks.